Story: Toby is 11 years old and is sassy as ever! He does not Like to many people but is my buddy. He is quite temperamental at times and very vocal, that’s what I love about the breed. He is very protective of me and our home I hope to have him in my life for many years to come. 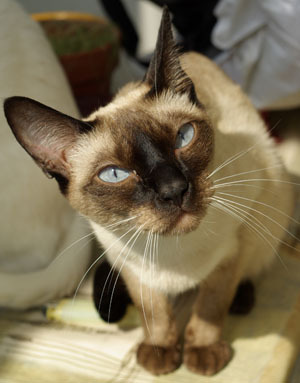 Story: I love my little Siamese kitten, Gucci! He always talks to me and sleeps by my side in bed at night. It’s upsetting when I leave my room because whenever I leave he gets lonely and cries. :( I’m planning on teaching him to sing the “We are Siamese” song! Story: her name is boo and she has the look that says butter would not melt in her mouth. yer right, try telling that to the westie dog that lives next door, he is terrified of her. the reason why, well one day he thought it would be fun to chase her, unfortunatly for him the tables were turned and she chased him and had him pinned in the corner before i called her off. her reputation soon spread around the local dogs and now strangly they avoid coming into our close any more! and she has such an inocent face, more like a sheep in wolves clothing. her antics continue on a daily basis which never fail to bring a smile to my face.